Using the built in 12F675 Comparator. 12F675 comparator test circuts and code. Note: This information is applicable to any PIC Microcontroller that has a built in comparator. There is one comparator in the 12F675 which you can set up in many different ways and you can even supply a comparison voltage from an internal reference. This voltage can be set to any of 32 steps. This is just a simple project designed to show simple operation so that you can use it. It shows all you need to do to operate the comparator. The comparator is high speed with a specification of between 150ns to 400ns (150ns typ , 400ns max). The typical response time is better than the standard response time of an LM311 which is 200ns - but you may get up to 400ns for the PIC comparator - thats still very good. Note This is one of the strengths of the comparator module - the fact that it operates independently from the processor and has an extremely fast response time. One piece of information that is only implied by the documentation is that the comparator inputs must be set to analogue inputs - otherwise the comparator does nothing! So you need to control ANSEL. Registers associated with the comparator. 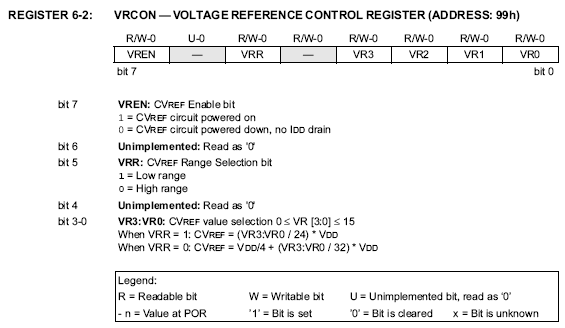 VRCON Comparator voltage reference control. VRCON for the Voltage reference. Download code here : Click to download. // Author: J F Main. // and any other documentation. // Comparator with external input and output. // Show device is active on power up. 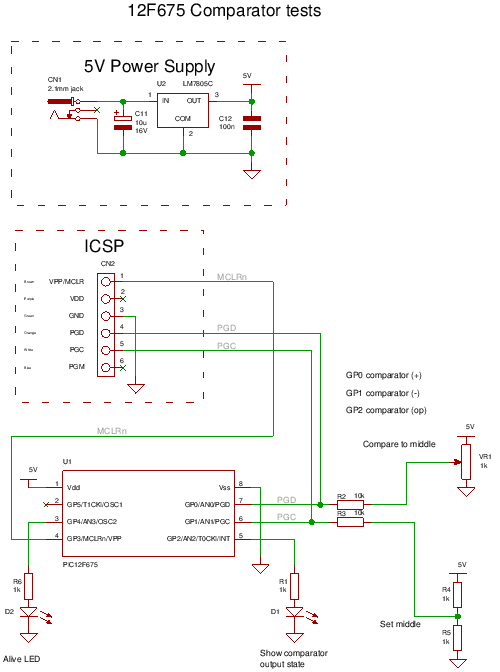 Note: To run the above code you may need to remove the ICSP connections after programming as the comparator pins are on the PGD and PGC lines. The code simply flashes the comparator output LED 5 times at start up and after this the comparator is turned on. Then the second LED is flashed continuously. By changing the POT setting you can see the comparator output turn on and off.